Allan Kaprow, Fluids, as recreated at the Neue Nationalgalerie on September 16, 2015 with support from the Allan Kaprow Estate and Hauser & Wirth. Photo copyright of Thomas Bruns. The hologram was projected for no more than twenty minutes on a floating cloud of ash in the early morning. The left side of the subject’s face disappeared into the shadows of the dark blue sky. Columns of hazy smoke billowed up nearby, supporting the image on a luminous, fluctuating cloud. While the image was held together by particulates drifting in the slight wind, light filtered through where the haze broke, tossing the image between bare branches, and the triangular absences between them, to form a fragmented head and shoulders. Cast askance by a whirring projector bulb, the image seemed to sit off-kilter and slightly behind the empty cavity of a stone pillar which, until recently, had been occupied by a physical statue. The authoritative light projection at the pillar’s base revealed its inscription: “SNOWDEN.” A ghost who dissipated immediately after its appearance—only the image’s producers and a few early morning joggers paused long enough to witness the action. The Illuminator Art Collective—the activists behind the hologram—packed up their projection equipment and electrical generators and headed home from Brooklyn’s Fort Greene Park.The hovering hologram had been placed alongside the other statues and pillars in the park’s Prison Ship Martyrs’ Monument, a memorial dedicated to the US soldiers killed after being held in maritime detention aboard British ships during the Revolutionary War. The site provides a politically-laden context for the work. After leaking top-secret US surveillance documents, Edward Snowden was pursued and threatened with detention should he travel beyond his asylum in Moscow—tying his experience and legacy to the 18th century detained revolutionaries, to which the monument is dedicated. The hologram’s installation was not the first attempt to memorialize Snowden. A physical bust of Snowden along with a label had been installed on the same pillar the day before, only to be promptly removed by the New York Police Department. Left: light projection of the Snowden monument by the Illuminator Art Collective, April 7, 2015. http://theilluminator.org/edward-snowden-hologram/; Right: original sculptural intervention Prison Ship Martyrs Monument 2.0 by Jeff Greenspan, Andrew Tider, and Doyle Trankina, as seen the previous day. https://jeffgreenspan.com/snowden/. Both images accessed publicly on the artists' websites. Monument 2.0 aimed to upend the public conversation on Snowden, who had been portrayed throughout the mainstream media as a traitor on the lam, and to recognize him as deserving of public, national honor by placing the bust alongside the park’s monumentalized soldiers. Snowden’s expression matches the staid mien of a typical monument. He seems unfazed by accusations of malfeasance. Upon discovery of the monument, two New York City Park officers covered the statue with a tarpaulin until it could be taken into police custody, submitted as evidence of vandalism, and catalogued. When the officers arrived to fasten the tarp across the statue’s face, clambering up the memorial, they hoist themselves up, treading on the bronzed head and wings of the bald eagle, unfettered by allegory. Immortalized in the recurring loops of the short-form, video hosting service Vine, the moment mutates into a parody of justice: the officers’ act as a covering and binding of state secrets; the quotidian denial of transparency; and a continued effort to keep democracy under foot, nearly two years after Snowden’s actual leaks. Tagged and transported in NYPD vans, the statue was impounded and held in police custody Exactly one month later, the artists negotiated its return with the help of civil rights attorney Ron Kuby, who represented the artists against the City of New York and arranged for the statue’s reclamation in exchange for each artist’s acceptance of the summons and fifty dollar fine for after-hours trespassing. Unlike this physical intervention, the Illuminator Art Collective’s hologram was treated as neither a legal violation nor a threat by authorities. The activists did not conceal their identities, publicly claiming the temporary artwork as their own. While they have, on occasion, run into legal and police trouble during their political actions, it has rarely inhibited their work. After they staged their holographic intervention, recording as they went, they left the park without conflict. The two interventions envisioned near-identical images, but the prompt response of authorities was radically different when the Snowden statue was installed than when the hologram was projected. Moreover, since the physical sculpture and projected light were both interpreted in online arenas, the in-person experience became a footnote in the political and artistic experience. Prison Ship Martyrs Monument 2.0 being covered with a tarp by New York City Park officers on April 6, 2015. In some ways, Earle’s phrasing around conversation after the disappearance of a material structure draws from, and upon, many avant garde theories in art history. Whether a Dada-like inflection of art into life, Conceptualism’s erasure of the commercialized art object, or the Duchampian forsaking of craft for readymade objects, his remarks recall a familiar thread of artists pushing up against established definitions of filigreed-objects and physical limitations. This reliance on the continuation of a conversation sans materiality (and in spite of it) is one with historical precedence in modern art practices of the 1950s and 60s, exemplified in many of the events and exhibitions organized by American performance artist, instructor, and theoretician Allan Kaprow. In the late 1950s, Kaprow developed a form of social and ephemeral performance known as happenings—events, which reimagined gestural abstraction as participatory action in dynamic, three-dimensional space. One happening in particular, titled Fluids (1967), combined the short-lived nature of performed action with the slow transition from material to immaterial artwork. Fluids developed from a basic premise: a crew of participants built architectural enclosures using ice blocks. The imposing structures shed their authority as the blocks slowly melted, collapsing finally into a tepid puddle on the floor. At eight feet tall and eighty feet around their perimeter, the blueprint of Fluids was constructed around twenty times, meaning many ice enclosures were built and left in public spaces throughout Pasadena and Los Angeles. The Southern California heat acted quickly. 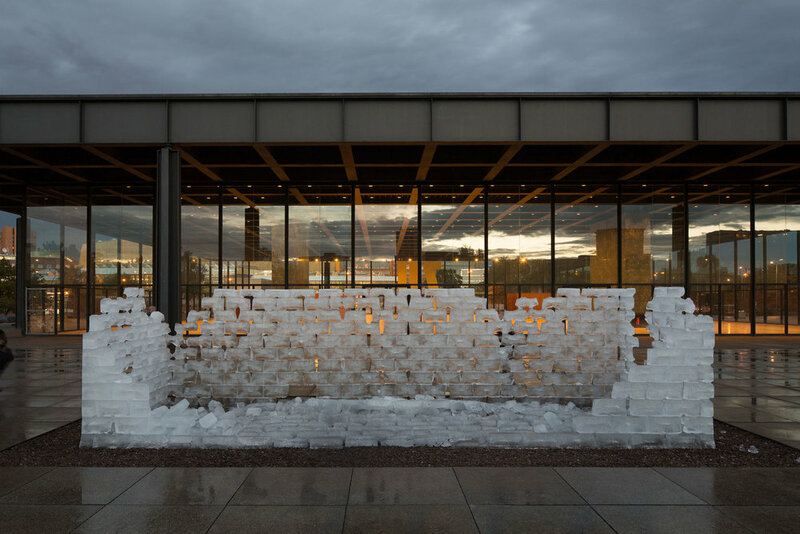 The happening was at once a sculptural intervention, a social event, and a conversation for members of the public who came across the disappearing structures, and those who built it. Happenings like Fluids provide a useful reference point for the history of social actions and performance in public space and their infinite echos. Image from the collection of the Allan Kaprow Estate and Hauser & Wirth. Photo copyright of Julian Wasser. "It follows that audiences should be eliminated entirely." As readers googling and scrolling our way through current events, we cannot know precisely what occurred on that morning in Fort Greene Park. We cannot visit the projection, now housed online as a series of images, while the ash has floated off and the projectors are packed away. Instead, we must rely on translations produced by the artists and an unknown (and likely insignificant) number of viewers. The Snowden hologram and sculpture exist within the realm of art, as they reimagine the public monument by referencing the classical style of a bust. In this way, it is unlike many contemporary protests publicized in the media, which are relegated to sphere of political action. Nevertheless, once converted into a series of images circulating in the media, it conforms to the same standards as many other political actions and acts of protest. It becomes a digitally-broadcast action. The performance of the event—the placement of the statue, projection of the hologram, or even the construction of ice-block buildings—goes unwitnessed and unattended by the majority of its audience. In addition, the event itself is ephemeral. The statue is removed, the projection switched off, and the frozen structures melt away. As with many of the increasingly frequent digitally-broadcast protest images circulating through media and online sites, one must consider these ephemeral events as a performance of closely-choreographed moments. They are in part prepared for the experience in situ, but critically, their choreography extends to their transmission through digital media as images. The audience, therefore, is transformed—not as Kaprow envisioned his audience becoming present and active participants or part of the very makeup of the happening. Rather than taking on the role of participant, the audience in these temporary interventions acts as a vast panoply of passengers, observers, and adjudicators, permitting or prohibiting the flow of reported information, imbuing their own biases on the success, relevance, and perceived stance of politicized moments of expression. Many of us have taken on these roles, of observing and opining as passengers on political activity. Others are more active participants, joining in during marches and organized political events. And strangely, with today’s swollen social media industry, we are given increasing opportunities as both audience and participant in political forces, both democratizing and reactionary. This increased participation and awareness, however, comes with its own conflicts. Spread from the publication Allan Kaprow: Fluids (Cologne: Walter König, 2007). Book design by P. Hermann and FLAG, Zurich. Happenings should be performed once only. Within the context of globalized, digitized culture, tactical shifts and cohesive decisions are often harder to arrange. Tufekci is familiar with the unease induced by digitally-organized protests, many of which seem to fall apart at exactly the wrong moments. Although it may have become simpler today to assemble a crowd, what has been gained in mass has somehow lost traction through organizational failures. Many movements cannot change direction when the moment comes to bargain. Indeed, on-the-ground organizing can often struggle against the swift currents of mass media reporting and the unpredictable distortions presented through appropriated imagery. The agendas of media outlets and online reposts can be difficult to predict and self-serving. While a heavy statue placed in a park in the early morning is censored by the afternoon, the digital images of the statue and hologram, released online, also find themselves in unfamiliar territory. For actions that gather public attention, the creation of these networks of appropriation and refashioned news stories is often an inevitability. Rather than decry misunderstood intention, modern political actions might instead aim to experiment with and occupy the site of visual consumption—the slurry of images, video, and textual fragments that can create political awareness, cohesion, and momentum. The space of visual consumption is where the visual makes meaning, and the form of the visual presents us with various possibilities, either democratic or otherwise. Allan Kaprow: Fluids, 1967, Getty Research Institute, Los Angeles (980063). from the collection of the Allan Kaprow Estate and Hauser & Wirth. Photo copyright of Julian Wasser. "Time, which follows closely on space considerations, should be variable and discontinuous." Circulating imagery through digital formats requires treating images as happenings that, like a melting enclosure or a hologram of a statue, do not require endurance, dissipating in a pool of water or a cloud of ash. Protest actions, in these instances, may appear fragmented, while actually serving strategic political purposes. Whereas traditional political action may be seen as unsuccessful, more ephemeral models of digitally-broadcast images might not necessarily be measured by a predetermined scale of political effectiveness. Perhaps digitally-circulated political action falters in giving too much onus to authorship and impact, values that do not lend themselves to circulation, rather than emphasizing the processes of cycle and reformation. Rather than allowing our digitally-broadcast actions to become static visions that cannot travel new routes, we can uphold ephemeral actions and images that decay, transform, and reimagine themselves in the feedback loops and transfer processes of dissemination. 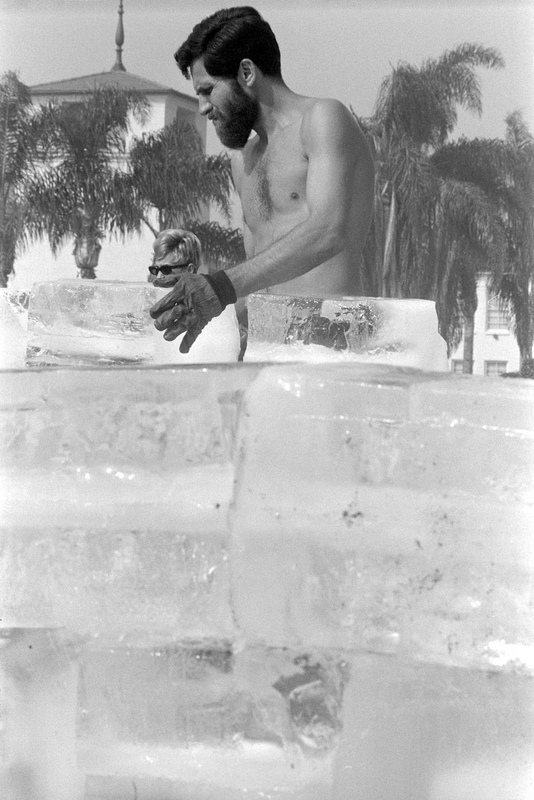 Allan Kaprow placing an ice block during the creation of Fluids (1967). Image from the collection of the Los Angeles County Museum of Art. Photo copyright of Dennis Hopper. As with the artists who created the ghostlike Snowden apparition are no longer in control of the image of their work, the digital images and videos that circulate online overtake the original image. They jump tracks, serving as lively conversation fodder and reaching far wider audiences as a result. Pixelated, compressed, and often lacking context, these images rely heavily on interpretation, viewership, and viral spread. They are networked into worldwide webs of distribution and often take blackmarket and illegal routes around commerce. Even when legal, they transform freely across the internet in the style of remix and appropriation. In the process, they exchange values like quality, resolution, and accuracy for transferability, often defining themselves with new values like velocity, intensity, and spread. As with the poor image, the afterlife of ephemeral actions also find themselves travelling virally, at high velocity, and spreading through both determined (media-influenced) and organic (social media shares and word-of-mouth) processes. They represent a shift in action and authenticity from the actual event—a la performance art—to its image and representation online—as with theater. The original is abandoned in lieu of the action in representation, as an often oppositional practice caught between strategic actors and commercial interests, media moguls, or an earnest attempt to capture a defiance feeling or moment. Placing these digitally-broadcast protest images in relation to Steyerl’s notion of the poor image, I propose their flexibility. These images do not solely cater to velocity and transferability, swarm circulation, and networked dispersion—but also stutter, stall, and fall apart, the products of internet fads ebbing and decaying. They exist within fleeting socialities in that the networks that contain them are the product of interactions, both human and robotic, which last only as long as the interaction. Christopher Squier is an artist, writer, and curator living in San Francisco. He is an editor for Dissolve, exhibits with R/SF Projects, and currently works on the Exhibitions team at the San Francisco Art Institute. His research-based practice uses interdisciplinary media to investigate the artifacts of optics, the materiality of light, and the overlapping spaces of design, culture, and violence.